Poison Dart Frogs are small. They are only one or two inches long. They can be found in the rainforests of Central and South America. 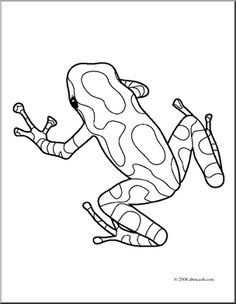 Unlike most frogs that are nocturnal (meaning they are active at night), Poison Dart Frogs are diurnal (meaning they are active both during the day and at night). They like to eat ants and small insects. 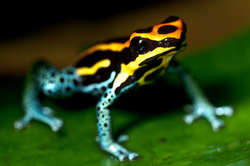 Poison dart frogs are brightly colored to warn predators they are poisonous. 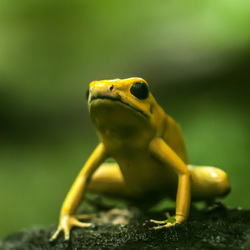 The Golden Poison Dart frog contains enough poison to kill 10 adult men. For hundreds of years there have been indigenous people (those are people who originally lived in the area) such as in Colombia South America that have coated the tips of their blow darts before hunting. That's how the frog got it's name. The poison in their skin is believed to come from the poisonous insects they eat that leaches out of their skin.